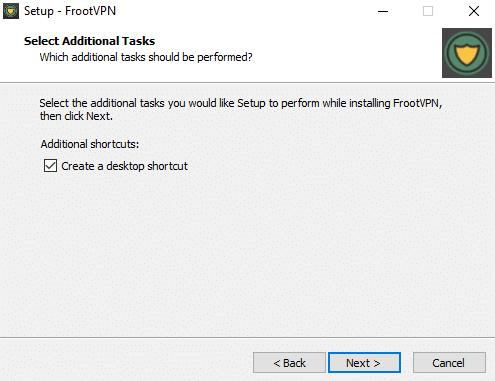 FrootVPN Review 2018 – Is FrootVPN Secure and Private? 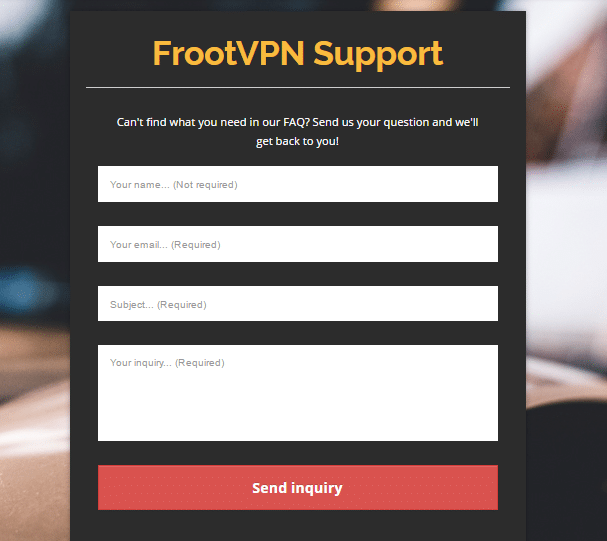 Mandee Rose | Posted on March 20, 2018 March 20, 2018 | Leave a comment on FrootVPN Review 2018 – Is FrootVPN Secure and Private? 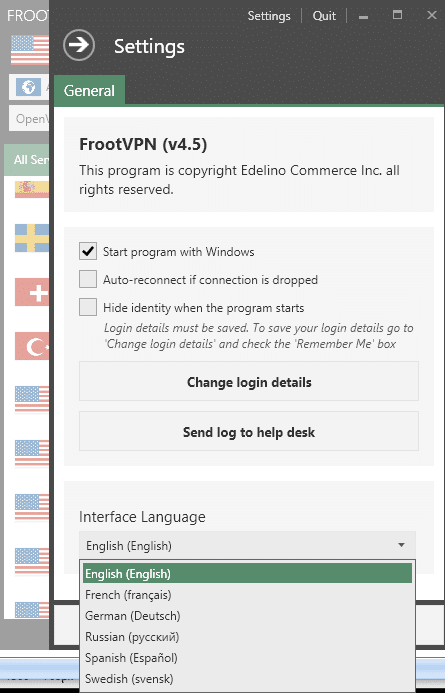 FrootVPN is a Swedish-based Virtual Private Network (VPN) service that began as a system to protect torrenters. The newly-formed VPN was heavily promoted by The Pirate Bay, earning it 100,000 new users in just one day. 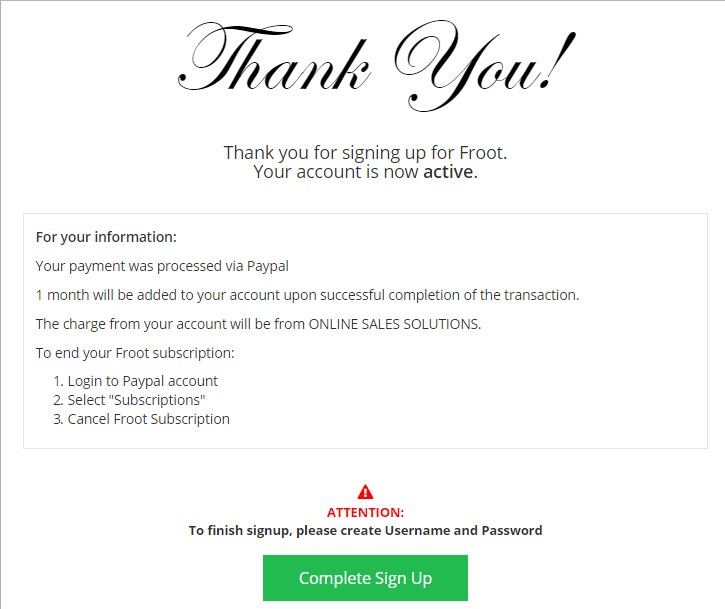 Initially a free service, Froot now charges for its VPN, but it is priced as one of the cheapest services in the industry. 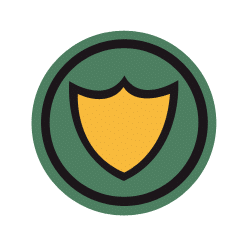 The FrootVPN branding has great design qualities, making it a good-looking app that will appeal to the style-conscious. You may have heard that FrootVPN is free. Well, it used to be. Then it had a free trial, but that has now gone too. FrootVPN’s developers have created quite a bit of confusion over the possibility of a free version of the app because they haven’t adjusted all of the site or the app to remove references to the free trial. For example, when you sign up for the service, the payment button is labeled “Upgrade Now.” Upgrade from what? When you launch the app, it will give you the option of “Get Free Trial.” However, you have to pay for the service before you can download the app. So forget about the three-day free trial! How Much Does FrootVPN Cost? Although based in Sweden, the company sets its prices in US dollars. However, it actually charges in Euros, so the amount that appears on your credit card bill may be different, according to the exchange rate. 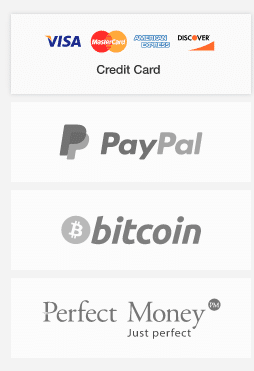 You can pay for the service with a credit or debit card, PayPal, Bitcoin, or Perfect Money. A serious security oversight that I noticed while doing this FrootVPN review is that the app doesn’t have a kill switch. A kill switch prevents applications on a computer from connecting to the internet when the VPN is not turned on. Sometimes VPN connections can get disrupted, so you could lose protection. If your computer is set to automatically reconnect to the internet, or if the connection continues without the VPN applied, then you will be using the internet without any protection at all. The company uses Advanced Encryption Standard (AES) encryption for its OpenVPN and L2TP connections, with a 256-bit key in both instances. The FrootVPN implementation of PPTP uses a 128-bit encryption key, which is less secure. These session encryption systems use symmetrical keys. That means both ends of the connection need to know the same key in order to communicate. The key distribution phase of a VPN connection is a potential weak point. FrootVPN uses 2048-bit key RSA encryption for key distribution. This is not the greatest security in the industry because many VPN services have now increased the strength of their RSA key up to a 4096-bit length. The company states that it does not archive any session details of customer activities. It also keeps payment details on a separate server, so the only identifying information it has about each customer is the email address. You could open a webmail account anonymously to use with your FrootVPN account if you want to keep your identity private. FrootVPN began as a service for torrenters, so it is very aware of the importance of privacy. 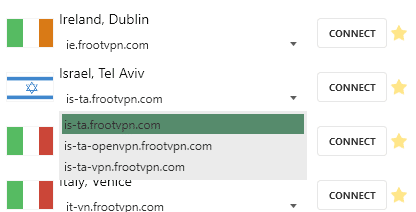 The stated number and location of the FrootVPN servers varies on each page of its website. I counted the servers and countries available in the app and went with that number. I arrived at a figure of 44 servers in 30 countries. This is actually better than the number of FrootVPN servers that the company reports on its pricing page. Click on the pricing options on the site’s homepage or select “Order VPN” from the top menu to get to the sign-up page. You need to select your package from the three subscription periods availabe. Next, enter your email address in order to progres to the payment section. Confusingly, the sign up button is labelled “Upgrade Now.” This implies that there is a free version available. However, there isn’t. The company offers a 30-day money-back guarantee, so you can use it for a month and then get a refund. The one-month subscription comes with a seven-day refund window. Be sure to uncheck the “Enable Subscription” box, otherwise you will be stuck with a repeat billing agreement. After the payment clears, you will receive a confirmation email and the site will redirect to a Thank You page. You now need to create a FrootVPN account. Click on the “Complete Sign Up” button to do so. The setup page does not present any challenges. 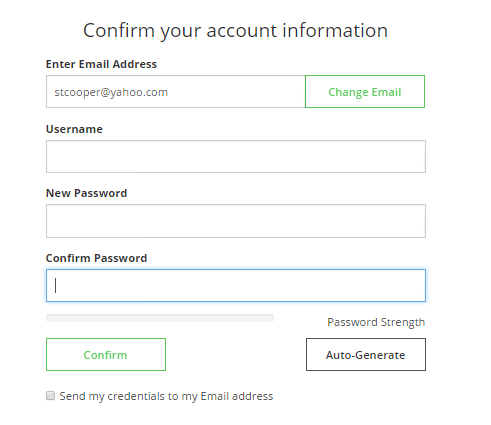 Once you press the “Confirm” button, your account will be created and you will be taken to your account area on the website. You’re in! Don’t ignore the welcome email that FrootVPN sends you. You have to click on a link in the email to confirm your address before the account will be active. The FrootVPN account page that you land on after creating your user credentials contains a button for the app download. The system will detect your operating system and present the appropriate installer. If you want to install the app on several different devices, you need to log in to the account area from each, then click on the presented app download button. 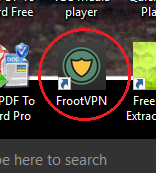 After clicking on the download button, you will be taken to the FrootVPN download page, with a second button to press. Click on this button to get the installer to download. The first installer pop-up asks you to select your language. You will then be presented with the terms of service. You have to agree to these in order to continue with the installation. After that, you just have to click through each screen to get the installation to begin. The app should launch itself as soon as the installation completes. The installer should have created a shortcut icon on your desktop. Click on this to open the app. The first time you open the app you will be asked to log in. Use the username and password that you set up just after you paid for the service. 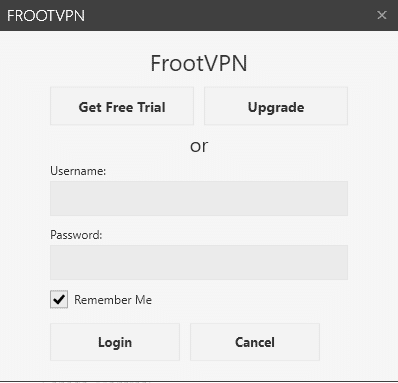 You probably noticed the option for a FrootVPN free trial (see above image). However, don’t kick yourself for missing a freebie – there is no free trial anymore; the developers just forgot to take that option out. After setting your credentials and pressing Login, you won’t have to sign in again, even if you close the app down and reopen it. The app’s interface is incredibly easy to use and has very few settings to change. Your main task it to select a VPN protocol, click on a server, and the hit the “Quick Connect” button. The main panel of the app contains a few more server options. The VPN has 30 servers in 20 countries. You can pick just a country from the top drop-down list or select a specific server from the lower list. You can get a list of server addresses if you click on the down arrow next to each server in the lower list. This information is useful if you want to set up a VPN connection manually. However, if you are only ever going to use the app, you won’t need to concern yourself with these details. The VPN protocol name at the top of the app also gives access to a drop-down list. This enables you to change the methodology that will be used to protect your connection. 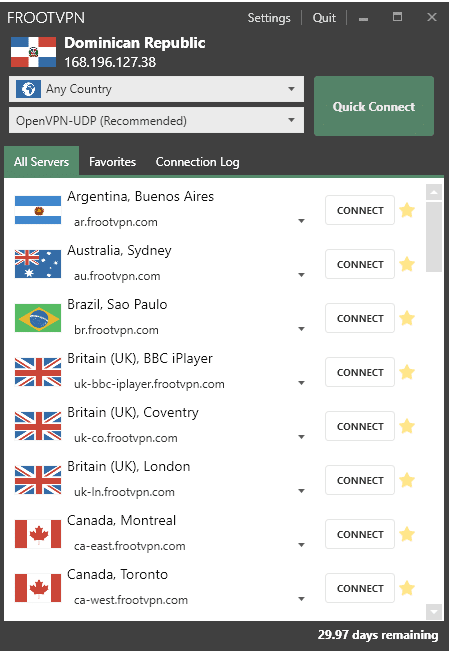 The makers of the app recommend that you use OpenVPN over User Datagram Protocol (UDP). This is the industry standard VPN methodology. UDP is a faster connection method than Transmission Control Protocol (TCP). PPTP and L2TP are older protocols – you would be better off sticking with OpenVPN. The top of the app shows your IP address and country location. 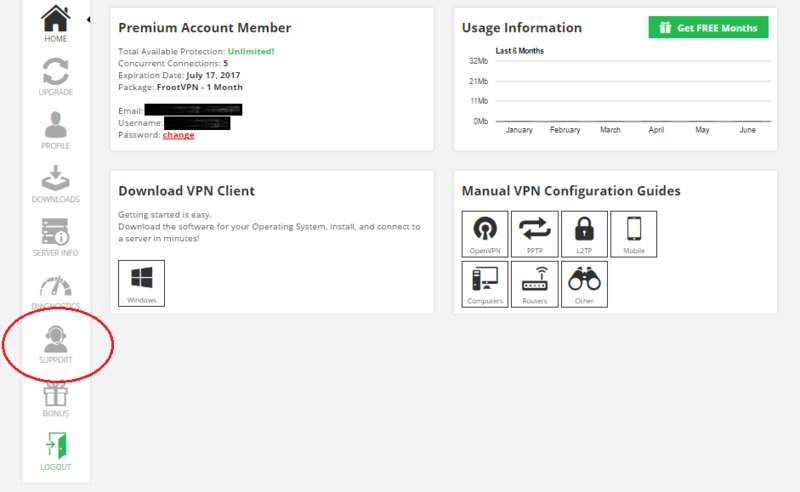 Before you connect to a VPN, this will show your home connection. Once your connection through a VPN server has been established, this graphic will change to show the IP address and location that the world now thinks you have. The Settings page gives very few controls. A commendable feature of this VPN service is the ability to switch languages – most VPNs only offer apps written in English. The helpdesk can be accessed from the company website. There is a live chat system on the site, but it is rarely manned. You can look to see if anyone is there by checking out the message at the bottom right of each page in the site. “Leave us a message” means that no one is on the helpdesk. You can also get to the support page through the left-hand menu in your account page. Both routes take you through to the same page. The troubleshooting guides are not very comprehensive, so you will probably have to resort to the support desk for help. The support request form is very straightforward. Replies to your request will be sent to your email Inbox. Although a VPN adds a lot of processing and rerouting to your internet connections, it need not necessarily slow down your connections. This is because VPN companies often have better connection agreements with intermediate networks than cost-cutting local Internet Service Providers (ISPs). To check out whether FrootVPN is able to maintain good speeds on its service, I tested a range of connections from a location in the Caribbean to the US and to the UK. These tests were performed with speedtest.net and in each case when the VPN was applied, I selected the FrootVPN OpenVPN over UDP option for the app’s protocol settings. The first FrootVPN speed result demonstrates a standard local connection without a VPN. Typically, speeds on this internet service are between 2 Mbps and 3 Mbps. Also without FrootVPN, a standard connection to Miami got these speeds. I chose the Froot server in Florida and turned the VPN on. I then tested the connection to Miami again. There was little change in the speeds achieved. Small variations in speeds can be down to the performance of the basic local internet service, so it can be seen that applying FrootVPN to the connection had little impact on speed. 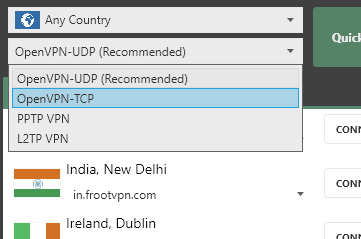 I selected “Britain” from the top drop-down selection list in the VPN app. Froot has three server locations in the UK, but I do not know which was allocated to me. The speeds achieved during the test were a little better. This slight improvement could be due to ISP performance variations. For this FrootVPN review, I tested a number of video streaming sites with the VPN turned on. Most streaming services have regional restrictions, which block cross-border access. Access to streaming video is therefore often the main reason a customer chooses a VPN. Unfortunately, streaming services know that overseas access can be facilitated by VPNs, so they’ve invested in methods to identify and block their use. In the US, I tried to access video at the Netflix, ABC and NBC websites. These services usually block access from abroad. I used the Florida FrootVPN server and selected the OpenVPN over UDP option from the protocol drop-down list in the app. I was able to watch a show at the NBC website, but both Netflix and ABC detected the proxy and blocked delivery of videos. BBC iPlayer is a popular source of entertainment in the UK. FrootVPN has a specific server in the UK that is tuned to access this service. When I selected this server for access with OpenVPN over UDP, I couldn’t even get into the BBC iPlayer site. I switched to the FrootVPN server in London and tried the connection again. I was able to get into BBC iPlayer and watch a show. The proxy also evaded detection at the ITV and Channel 4 websites. However, FrootVPN couldn’t get me past the Netflix UK proxy detection system. Should I Subscribe to FrootVPN? FrootVPN was specifically designed to protect torrenters from being identified. However, there are a few troubling security oversights in the service that could leave your true IP address exposed. The absence of a kill switch is troubling. Security experts surmise that the Chinese authorities are now able to crack 1024-bit RSA keys and are currently working on the 2048-bit version. This is why many VPN services that want to help people in China have increased their RSA security to use 4096-bit encryption for key exchange. It would be good if FrootVPN could do the same, otherwise it might not guarantee your privacy in China for much longer. The VPN didn’t perform very well at getting into streaming services. Although this is not the only VPN service that can’t get into Netflix, this provider won’t be any good to you if that is the specific reason that you’re interested in subscribing to a VPN service. The positives of this VPN include a very easy-to-use and attractive interface. If you don’t know much about internet protocols, then you’ll be relieved that this app doesn’t require any specialist knowledge in order to get it working properly. The availability of the app in languages other than English is very unique, so if you speak French, German, Russian, Spanish, or Swedish and are sick of being forced to read English, this could be the VPN for you!